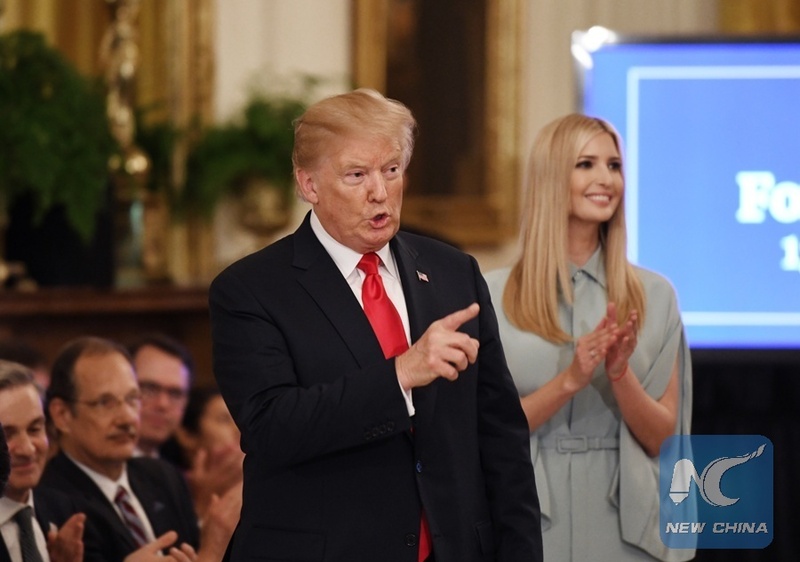 WASHINGTON, Aug. 14 (Xinhua) -- U.S. President Donald Trump was liked by 31 percent of U.S. voters as a person, while disliked by 59 percent of them, a poll released Tuesday found. Two-thirds of Republican voters, 66 percent, said they like Trump, but only 8 percent of Democrats said the same, the Quinnipiac University poll showed. Among the independents, 24 percent said they like Trump, according to the poll. The controversial president received better marks from men than women. The poll found 36 percent of men and 27 percent of women said they like Trump. Meanwhile, more respondents approve of Trump's policies than his personality. Overall, 43 percent said they approve of Trump's policies, compared to 54 percent who don't. Only 6 percent of Democrats approve of Trump's policies, compared to 40 percent of independents and 86 percent of Republicans. The Quinnipiac poll surveyed 1,175 voters from Aug. 9 to 13, and has a margin of error of 3.4 percentage points.